The Pacific Northwest tribe of Shahaptin Indians was dubbed the "Nez Percé" by French-Canadian trappers. It is believed that the name came into existence because some of the natives sported nose rings and other nose ornaments. The Lewis and Clark Corps of Discovery encountered them in 1805. At that time, the Nez Perce tribe had a population of about 6,000 people. The 1855, the Walla-Walla Treaty called for the Nez Perce to sell a great deal of their lands to the government. The treaty instructed the Nez Perce to abandon their ancestral country and relocate to Oregon's Umatilla Reservation with the Walla-Walla, Cayuse, and Umatilla tribes. Following the discovery of gold on Nez Perce treaty land in 1860, thousands of miners and settlers invaded the Nez Perce homeland. In the beginning, the government tried to protect the Nez Perce treaty lands, even as far as to send in cavalry and erect a fort in the Lapwai Valley. But because of the growing wave of miners and settlers, the Army finally gave up trying. Through the 1863 Lapwai Treaty, often called the "Thieves Treaty," the U.S. Government acquired approximately six million acres of Nez Perce treaty land. Then to add insult to injury the U.S. Government ordered the Nez Perce to a reservation in Idaho that was only 10 percent the size of the original reservation. By 1877, President Ulysses S. Grant opened the Nez Perce homeland, the beautiful Wallowa Valley of Eastern Oregon, to white settlement. In addition, the U.S. government demanded that all roaming Nez Percé bands promptly move onto the Lapwai reservation in present-day Idaho. While Chief Joseph's younger brother, Ollokot, was a hunter and warrior, Joseph was a man of peace and acquired a reputation for his wisdom. When Chief Old Joseph, his father, died in 1871, the tribe elected Joseph to succeed his father. Besides not only inheriting his father's name, Joseph, he inherited the responsibility to meet with the U.S. Government representatives on behalf of his tribe. The situation made progressively more explosive as white settlers continued to pour into the Wallowa Valley. Chief Joseph rejected the idea that the Nez Perce give up the Wallowa Valley and live on the Lapwai Indian reservation in Idaho. Along with other non-treaty Nez Perce Chiefs, including Looking Glass, White Bird, Tuhulhulzote, and Hahtalekin, they controlled about 200 warriors. Chief Joseph continued to argue for peace, and at a war council called by the Sioux in 1874, he refused to take part in raids on white settlers. At the same time, though, he resisted all efforts by the U.S. Government to force his band onto the small Idaho reservation. In 1873, a Federal Court order mandated the removal of white settlers and let his people remain in the Wallowa Valley. But soon, the U.S. Government actually overruled its own ordered mandate. Imagine that! Then in 1877, General Oliver Howard threatened military action to force Joseph's band and other holdouts to relocate. It's true, when Joseph met to discuss the demand with one-armed Civil War veteran Brigadier General Oliver Howard there was little discussion because Howard delivered a 30-day ultimatum with a threat to comply, or else. Worried about the safety of his people, and not wanting to provoke the military into conflict, Joseph and his brother, Ollokot, agreed to move the entire Wallowa Band of Nez Perce to the Lapwai Indian reservation in Idaho. The bands reluctantly began to move on June 15th, 1877. Just when everything was starting to get underway, tensions began when a group of young Nez Perce warriors staged raids on settlers. The young warriors killed some settlers along the Salmon River, and the Army was notified. The elders first hid the young warriors, but Joseph knew that retribution would shortly follow and he reluctantly prepared for war. Before this all took place, the U.S. Army had only non-violent contact with the Nez Perce. 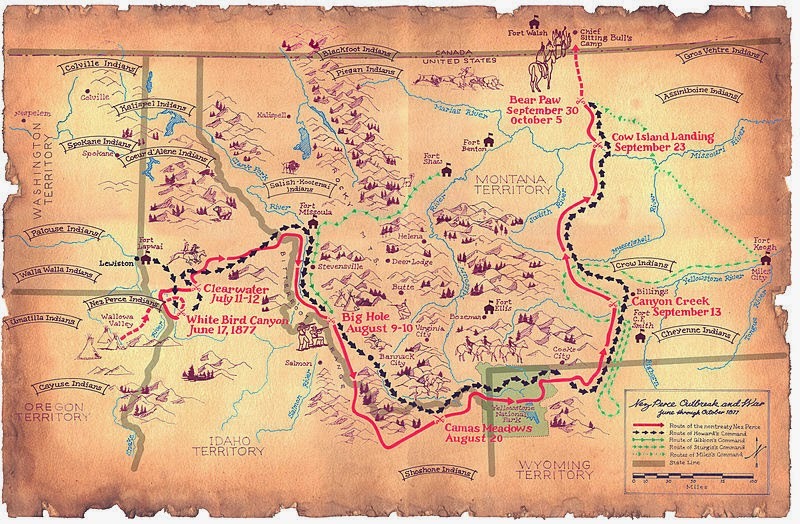 In fact, there was a history of cooperation going back to when the Nez Perce resupplied and helped Meriwether Lewis and William Clark to such an extent that it is believed that their help saved the famous Lewis and Clark Expedition from certain failure. Then in the 1830s, the Nez Perce also aided in the expedition of Captain Benjamin Bonneville, who took a leave of absence from the Army to proceed with his western expedition. The hostilities that had been developing during the 1870s between settlers and the Nez Perce turned into violent conflict during mid-June, 1877. On June 17th, 1877, the Army assembled its forces to march on the main Nez Perce camp. They were met by a force of 300 Nez Perce warriors who forced the Army to retreat at White Bird Canyon in Idaho. While the Army was beaten off from their attack, knowing that they could not win in an engagement against General Howard's full army, the Nez Perce fled as well. Chief Joseph, Looking Glass, White Bird, Ollokot, Lean Elk aka Poker Joe, and Tuhulhulzote lead the entire tribe of 2,900 men, women and children, east in an attempt to reach a peaceful sanctuary in Canada. It is said that they intended to seek shelter with their allies the Crow Indians, but the Crow refused to offer help so the Nez Perce decided to reach Canada and maybe join the camp of Lakota Chief Sitting Bull. Sitting Bull had taken his tribe into Canada after he decisively defeated Col. Custer and the U.S. Army in the Battle of the Little Bighorn. Canada looked like sanctuary to the Nez Perce with or without the Lakota, and so they headed there. That first engagement between the U.S. Army and the Nez Perce at White Bird Canyon in the Idaho Territory was a major victory for the tribe. Throughout that summer and early fall of 1877, the fighting skill of the Nez Perce and the military tactics of Nez Perce military leaders enabled the tribe to evade almost certain defeat by superior U.S. Army forces. The Nez Perce waged a war of hit and run, where they proved that they were an effective fighting force similar to our patriots who fought the same style of warfare against the British during our Revolutionary War less than a hundred years earlier. But right or wrong, with every move Generals Oliver Howard and Nelson Miles followed the Nez Perce -- trying to cut off the tribe's escape to Canada. That summer, Chief Joseph, Chief Ollokot, and others led their people on a remarkable escape attempt southeast through Montana, then back north across present-day Yellowstone Park. The Indians traveled more than 1,700 miles while outmaneuvering 10 units of pursuing U.S. soldiers. It is interesting to note that while he Nez Perce had no formal military training and travelled with their wives and children, the Army used thousands of soldiers during the 1877 Nez Perce campaign and were commanded by veterans of the Civil War with many years of military training and experience. The Nez Perce and the Army would engage several times as the Nez Perce traveled from their homeland in the Wallowa Valley through the Montana and Idaho Territories. It was believed that their goal was to reach Canada. By October of 1877, with winter weather coming on, the Nez Perce lacked food and supplies. But more importantly, the effects of moving an entire more than 1,700 miles over rough western terrain had began to take its toll on the tribe. Thinking they had finally shaken off their pursuers, the Nez Perce stopped for badly needed food and rest near the Bear Paw Mountains in Montana Territory. They were roughly 40 miles from the Canadian border, and crossing the border meant safety. Their obstacle to crossing into Canada was General Miles who had led his troops on a 160 mile forced march to catch the Nez Perce. So now, why did this all take place? Now before we go on with what happened next, let's ponder a question that my wife asked when I read this to her. She asked, since the U.S. Army wanted the Nez Perce off their traditional homelands, and the whole Nez Perce tribe did in fact do just that and left, why did the Army pursue them? Instead of confinement, they chose to head for Canada and freedom, so why did the Army bother stopping them? So really, why did the Army bother pursuing them as far as they did? Honestly, I can't find the answer to that. I honestly don't know the answer other than speculating that the Army's goal was to put the Nez Perce on a reservation and they were not going to allow anything else to take place. I believe that the Army saw it as a matter of "losing face" if the Nez Perce made it to Canada and defied the U.S. Government order to confine them in what was no better than a concentration camp of the time. The Nez Perce War started over the tribe's refusal to leave their land, but in the end they did. The U.S. Army pressed the issue over their refusal to relocate to a Reservation. Why the U.S. Army was so determined with putting the tribe on a Reservation instead of allowing them to simply leave the country and enter Canada is a mystery that I have not found the answer to. As for the last battle of the Nez Perce War, it started on September 30th and would last until October 5th, 1877. After a five-day battle, the tribe's horses were stampeded and General Howard's reinforcements were closing in fast. While Chief White Bird refused to surrender and found a way to escape to Canada with some of the band, it became obvious to Chief Joseph that continuing to fight was futile. It was then that Chief Joseph surrendered his remaining band of weary Indians to Generals Miles and Howard. The famous 1877 fighting retreat led by Chief Joseph and Chief White Bird, and others turned out to be the final and most extended Indian War in the region. "I am tired of fighting. Our chiefs are killed.... The old men are all killed.... It is cold and we have no blankets. The little children are freezing to death. My people, some of them, have run away to the hills and have no blankets, no food; no one knows where they are, perhaps freezing to death. I want time to look for my children and see how many of them I can find. Maybe I shall find them among the dead. Hear me, my chiefs, I am tired; my heart is sick and sad. From where the sun now stands, I will fight no more forever." As a matter of interest, the U.S. Army awarded the Medal of Honor to Captains Edward S. Godfrey and Myles Moylan for their actions against the Nez Perce at Bear Paw Mountain. It is believed that 800 Nez Perce warriors defeated or held off the thousands of pursuing Army troops in 18 battles, skirmishes, and engagements. And yes, it is believed that more than 300 US soldiers and 1,000 Nez Perce including women and children were killed in this conflict. The Nez Perce were promised by General Miles a safe return to the Wallowa Valley. But in fact General Miles was overruled, and the Nez Perce were instead sent to Kansas and Oklahoma where the survivors of 1877 endured many more years of hardship. The Nez Perce War would not be the last conflict where the decisions and promises of battlefield commanders would be negated and disregarded by political forces and a physically distant command structure. During his people's brutal confinement at Fort Leavenworth and then in Oklahoma, Chief Joseph relentlessly appealed to the U.S military and the government for help to return them to their land. In 1879, Chief Joseph and another leader, Chief Yellow Bull, went to Washington, D.C., to meet with President Rutherford B. Hayes to plead their case for their people to return to their homeland in the Pacific Northwest. Then something that was never head of took place, Chief Joseph presented his case to the American people in which he provided his account of Nez Perce history and their treatment at the hands of their jailers. He did so in an interview with Reverend W.H. Hare. The interview was published in the North American Review in April 1879. For the remainder of his life, Chief Joseph tried unsuccessfully to convince the U.S. Government that he and his tribe should regain a place in the valley "where most of my relatives and friends are sleeping their last sleep." He made an attempt to win congressional support, but Senators from the west were not about to lend aid to the Indians. As with today, they were not about to take a stand that would possibly mean losing them the support of their constituents. Chief Joseph made such a favorable impression, however, that the Indian Rights Association that several wealthy Eastern philanthropists began to speak out on his behalf. And yes, Chief Joseph actually made several trips to Washington, D.C., and to New York City on behalf of his people to argue for their return. It would not be until 1885 that some of the Nez Perce were allowed to move onto the Lapwai Reservation in Idaho. Chief Joseph and others were sent to the Colville Reservation in Washington. On September 21, 1904, at age 64, Chief Joseph died alone in his teepee after serving his people for most of his adult life. The doctor listed cause of death as "a broken heart." His remains were interred in the cemetery on the Colville Reservation. He was a Nez Perce Chief, a man of his people who lived most of his later life separated from the people and land that he dearly loved. In the Wallowa Valley is Joseph Creek, a tributary of the Grand Ronde River in present-day northeastern Oregon. Joseph was born in a dry cave near that creek in 1840. It should be noted that Chief Joseph's Indian name was "Heinmot Tooyalakekt" which means "Thunder Rising To Higher Mountainsides." It's said that, as a youth, Joseph gained a great deal of his knowledge of the American military by just watching U.S. soldiers during their training. He was a great Chief who was a natural leader. What made him a great Chief is that he fought for his people at every turn, which of course is more than I can say for those in leadership positions in the United States today. Because I believe many of our leaders today are more interested in working for their own self-interest than for us, I believe many of them can learn a great deal from Chief Joseph. No, just as I can't imagine President Abraham Lincoln taking time off from the crisis that faced the nation during the Civil War, I can't imagine Chief Joseph playing golf when there was so much work to do. Apparently politicians don't seem to have changed for the better.